Glass mirrors were not an option for this college. The mirrors we supplied were 6mm thick Acrylic Mirror fully bonded to 15mm moisture resistant MDF. 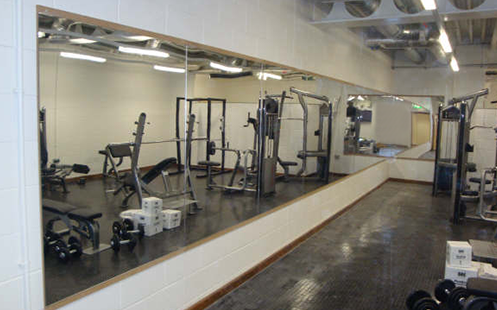 These gym mirrors are suitable for environments where public safety is of paramount importance. We would not recommend these gym mirrors for professional gyms or dance studios. Since 1997, we have been supplying safety mirrors to a wide range of environments, where public safety is of paramount importance. If you can’t see what you require or need any further advice, please contact us. On this site you will find our standard range of mirrors and fittings. All our mirrors are supplied with rounded corners and smooth polished edges, making them safe for all areas and age groups. The mirrors are manufactured from high quality materials that are lightweight and have a superb reflection. Acrylic is a strong, impact resistant material, approximately 10 times stronger than glass. These products are designed specifically for use in correctional and mental health environments. 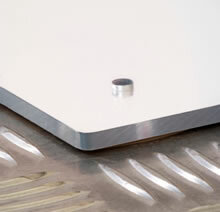 Glass mirrors are available in 4mm and 6mm thickness and up to a size of 3000 x 1500mm. The foam absorbs impact from a human body collision whilst the safety backing ensures the glass remains intact.